The answer to this eternal question, according to artists and architects Madeline Gins and Arakawa is to "cradle tentativeness". In an article in today's Home and Garden section of the New York Times the couple explains how by challenging the senses through our environment, we could continue to live forever. This theory is being tested by the design of their East Hampton, NY Bioscleave House. 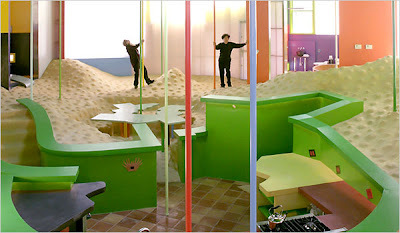 Undulating floors and primary colors are reminiscent of a children's playground, oddly-spaced windows and sockets placed off-kilter are specifically there to throw visitors off balance and so, explains Gins, to wake up the immune system as the body struggles to maintain its equilibrium. If you do start to wobble, grab one of the strategically placed poles, or suggests Arakawa, wriggle across the floor like a snake, as residents of the “reversible destiny” apartments in Mitaka, Japan were told to do. Be sure to visit the multimedia presentation A Death-Defying House for more images, an interview with the designers and an attempt at an explanation of their philosophy. Huh. That's an interesting idea. Make everything inconsistent to keep you sharp (mentally, physically). I wonder when they will have some kind of results. Seriously? Wriggle across the floor like a snake? Why does this remind me so much of that SNL skit with Nuni and Nuni?